Vitality Extracts has a number of signature blends, each designed with specific goals in mind. They work great in a home or car diffuser, or have a whiff all day long with your diffuser jewelry. Vitality Extracts Stress Away Essential Oil Blend is a mixture of Bergamot, Sweet Orange, Ylang Ylang, Pink Grapefruit, and Patchouli. This combination of natural ingredients was created to help out with the everyday stresses in your life. Whether it’s driving on the freeway, trying to get the kids off to school and yourself to work, or just to give you a calming effect, this is the perfect blend. Stress Ease induces relaxation, reduces nervous tension, uplifts, calms, and regenerates. Use it to balance stress and anxiety, as well as increase memory and mental agility. Try a few drops on the Calming Lava Stone Diffuser Bracelet made with White Howlite stone, a calming gem. It helps relieve stress, increase self-awareness, calm your mind when it’s overactive, and can aid in sleeping. Not enough sleep last night? Feeling sluggish in the middle of the day? Energy Essential Oil Blend helps uplift your mood, stimulate your mind, and increase energy. It’s a combination of Rosemary, Juniper Berry, Juniper Needle, Silver Fir Needle, Lemongrass, Clove, Nutmeg, and Black Pepper. Energy Blend is good for clearing the mind and increasing blood flow. Rejuvenate body and mind with Energy Blend, as well as balance stress and anxiety. Apply to a Blue Agate Buddha Diffuser Bracelet, a stone that uplifts, elevates, and has a positive effect on emotions and attitude. Or try a few drops on the Matte Jasper Diffuser Bracelet, which promotes vitality and perseverance, and can boost energy. 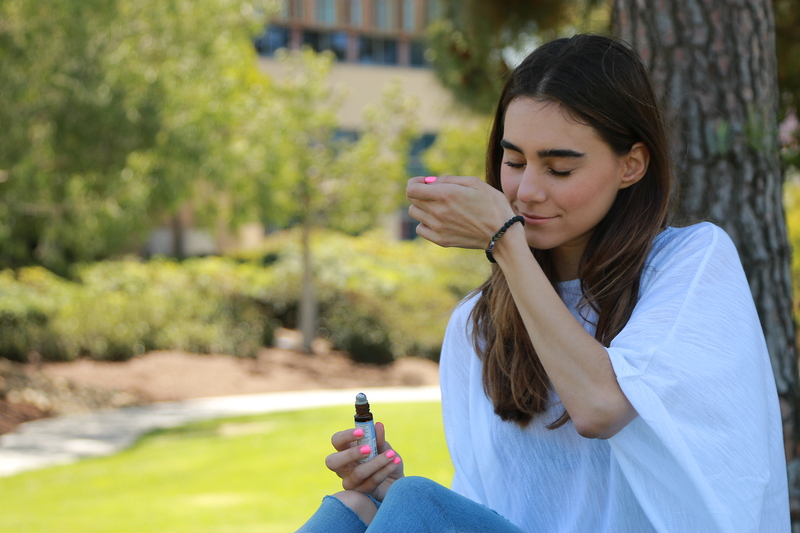 Vitality Extracts Inner Peace is a wonderful blend of Clove Leaf, Pink Grapefruit, Mandarin, Lavender, Bergamot, and Lemon. It helps increase mental agility and reduces stress and anxiety, leaving you in a more peaceful state. Myrrh is another good essential oil to diffuse when you’re feeling lost. It’s very centering and provides a rich scent that sedates and calms. The Faceted Hematite Diffuser Bracelet and the Sacred Arrow Diffuser Bracelet can add to your peaceful feeling. Both have hematite, which grounds and protects, strengthening your connection with the earth, providing feelings of safety and security. It empowers you with courage, strength, endurance, and vitality. Hematite helps balance the chakras, as well as give balance between the body, mind, and spirit. It’s also aids in dissolving negativity and preventing the absorption of negativity from others. Enjoy the Vitality Extracts blends to help you through feelings of stress, tiredness, or feeling lost. Add to the benefits of essential oils with diffuser jewelry made with stones to soothe and calm you.